Readers of this blog know very well that I’m a huge Throne of Glass series fan and book pusher, which also means I’m a huge Sarah J. Maas fan. And Sarah’s latest novel A Court of Thorns and Roses? IT. WAS. PHENOMENAL. This book is another triumph, introducing readers to a brand new story filled with an expansive world and appealing characters. It’s a combination of whimsical fairytale and high fantasy, and that caters so well to my personal taste in books. Writing a coherent review seems like a futile effort at this point, since I’m doubtful I can perfectly word how I feel. But I’m willing to give it a try, so that others might understand what about it is about A Court of Thorns and Roses that is so special and join me on the Sarah J. Maas fangirl train. … there was a girl named Feyre. I really loved Feyre! Her most appealing trait is the fact that she is, at her core, a very ordinary teen girl. She has no special abilities, no features that make her incredibly beautiful. But she has a stubborn will, a clever mind, a heart that loves fiercely – and those are things I could relate to. She’ll quickly win you over with her sass, curiosity and compassion, and you’ll only grow to love her more with every single chapter. … there was a faerie lord named Tamlin. Tamlin makes an appearance right away, demanding Feyre accompany him back to his land as retribution for killing a wolf in the woods. He is a very powerful fae, and comes off as aloof and angry. But there’s much more to him than just what he is; who he is reveals itself with time. Tam has a soft heart, an instinctive kindness and a desire to fight against the evil that threatens his kingdom, the Spring Kingdom. Feyre is torn up with guilt over being unable to provide for her family while she’s in the Spring Kingdom, even as she starts to relish the freedom she gets to figure out who she is without her family. She also struggles with the feelings she begins to develop not only for Tamlin, and the rest of the Spring Kingdom, as she discovers a familiarity and comfort with the fae and their traditions. Tam, on the other hand, is learning to deal with the responsibilities and hard choices he needs to make as the faerie lord of the Spring Kingdom. It’s extra difficult, because it’s a position he was never planning to take on and because there happens to be a blight spreading across all of Prythian. Well, to make things even more complicated, there are external things that affect them both. There’s a blight affecting the faerie lands. It’s taking away the strength of each fae lord, which in turns weakens their protection and their hold on their lands. Plus, there’s an evil queen who wants to get her hands on Tamlin for her own nefarious purposes – and she’s not afraid to shed a little blood to do so. You’d think with so many different things going on, it would be hard to keep track of or it would potentially feel unfinished. The balance is delicate, but Sarah manages to combine internal conflicts and external conflicts well. She blends in some romance, friendship, family, action, drama and feels to create this intense experience of reading A Court of Thorns and Roses. The reason it works, personally, is because Sarah makes it all feel like a fairy tale – whimsy, action, tricks and all. I’m obviously not going to spoil the ending, but I will say this: it ends with a note of finality. 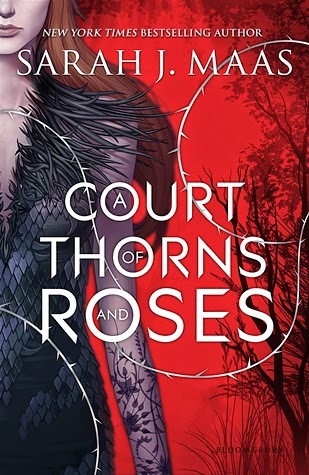 It doesn’t mean that there isn’t more to come (which there most definitely is), but it will satisfy the reader to know that we have some sort of closure for the events in A Court of Thorns and Roses. It’s really well-done, and it will leave readers happy and wanting more of this world and these characters. There is another Fae that makes an appearance - Rhysand of the Night Court. He’s got such a complicated, conflicted background. But, to be fair, he had one major goal in mind and just did what he had to in order to get himself (and everyone else) there. I’m admittedly curious to learn more about him, and to see what else there is to him. Feyre’s family are not my favorite, honestly. Her father, crippled from an incident with debtors, shows no backbone whatsoever in their poverty. Her sister Elain is sweet, but a touch too innocent. And her sister Nesta is simply bitter, angry at their circumstances and not afraid to be honest about it. Even though I understood where they were coming from and that people react differently in times of crisis, they really bothered me. Prythian is such a fascinating place! There’s a map in the book that shows it off entirely, including each of the separate Fae kingdoms. I’m honestly curious to visit other places based on that alone, since each of them have different traditions and customs. Whew. That was quite a lot! But I could talk about A Court of Thorns and Roses all day, every day if I had to because that’s how much I love it. (I’m not going to tell you whether I loved it more than the Throne of Glass series because comparing two very different stories is pointless. They’re both equally amazing.) Sarah’s magical story reads like all of the fairy tales I devoured in my tween years: impossible feats, daring battles, unusual magic, strong characters. It is exactly as impressive as the stories I have learned to expect from Sarah, and I’m certainly looking forward to more to love in the next one. I particularly liked how the ending wrapped up enough loose ends that I still want to read on but I'm contented to wait a while for the next book. But a year? Don't think I can! I'm so excited for this book! There are so many glowing reviews and I can't wait! I just finished this today and OMG. OMG! I agree: it's all kinds of awesome! Aw, Lucien... I really came to like him. And he made me laugh, which always gets bonus points, in my opinion. I'm more drawn to Tamlin though. I was writing my review and I also couldn't word things how I wanted too. I can't express how much I love this book! I think your review does the book justice, Alexa! It makes me that much more eager to read it. The romance sounds fantastic. I just hope a triangle isn't introduced in the sequel! I really can't wait for this book. In fact, I've been dying for it. I loved the Throne of Glass series and when this was announced I was relieved because I thought it'd help with the wait between books and then I read the description and FAERIES AND FAERIE COURTS AND MAGIC AND I AM SO EXCITED FOR THIS I CAN'T EVEN TELL YOU. And your review makes me even more excited! "Sarah made me giggle like a schoolgirl, blush like a virgin, and fan my face from the swoons" OMG I love this haha and SAME HERE. I love this book so much. All hail SJMaas!